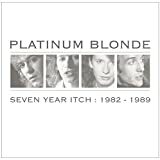 Platinum Blonde's, "Manchester United Theme Song"
off of you, you, YOU! Heed or Head. Platinum Blonde sang Heed for Kenny MacLean who was of Scottish decent and always sang it that way.